More festive baking coming your way 🙂 Christmas is right around the corner, can hardly believe it!! Preheat oven to 350 degrees F. In stand mixer, beat butter and sugar until light and fluffy. Add in eggs and molasses until well combined. In a large bowl combine the flour, ground gingersnap cookies, baking powder, cinnamon and salt. Add half to wet ingredients then half of milk and vanilla ending with remaining dry ingredients and milk/vanilla. Scoop batter into 12 lined cupcake cups and bake for 20-25 minutes or until toothpick comes out clean from center. Remove and let cool completely. To make frosting beat softened butter and powdered sugar in mixing bowl until smooth while slowly adding milk/vanilla and cinnamon in to get a smooth thick frosting. When cupcakes are cooled spread over tops and serve. 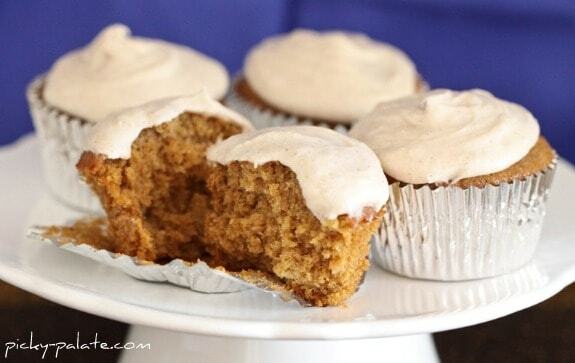 Gingersnap cupcakes. what a great idea! Cute video as well. can I make this into a cake instead? Gingersnaps are a favorite cookie of mine! What a great idea to incorporate them into a cookie! Perfect for the holidays. I always love a good cupcake. 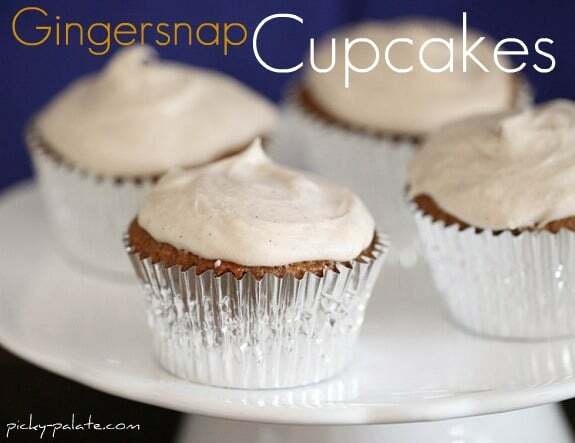 Gingersnaps and molasses in a cupcake sounds great! Your video made it look so easy too. considering my recent addiction to gingersnaps this sounds great! Yummy! What’s more perfect for the holidays than ginger cakes?! These look delish! ok, so i’m now officially 10 lbs heavier because i made your brownie-baked oreos last night! Lol! Me too girl…me too. Oh my goodness, this is a great cupcake. I love when you can turn favorite treats on their ear like this. Vanilla bean cinnamon buttercream! Oh my gosh! I would love to use that for my pumpkin whoopie pies. How much cinnamon do you add to the frosting? Yum! I love this time of year! So many delicious treats! Wow, that looks like such an insanely delicious cupcake! I have yet to find anything resemble gingersnaps or gingerbread cookies in LA. I’m confused because it seems like California should be all over that. Oh well, I’ll have to drool vicariously through these pictures. Hmmm, I’m not far from you and I can get them at Ralphs, Pavillions and Gelsons. Have you checked any of these? Sounds delicious! And I love the notebook paper graphic you have behind the recipe, that’s awesome!! You are way too nice girl!! ….but thank you!! YUM what perfect cupcakes!! Love the sweet spices in them and he frosting! Your recipes never disappoint! They look lovely! I put a link to this post in my blog. This sounds delightful!! I can’t wait to try it! These look delicious, Jenny! We are making gingerbread cookies today – wish I had some of these, too though! You are simply amazing! Those look delicious! Can’t wait to try them! These are so perfect for the holidays – so festive and yummy! That frosting has me drooling…I love the flavor combination. OK, the cupcakes sound great too, but I’d take a bowl of that frosting right now. Vanilla and cinnamon are two of my favorite flavors. I bet the frosting would be awesome on some homemade cinnamon rolls too! Definitely a genius idea to turn a classic cookie into a cupcake! that buttercream sounds delicious as well! 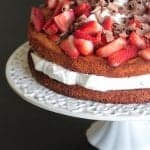 Love this Jenny – love if you can email me to chat about this recipe and babble! Oh, these are just perfect for the holidays. What a cute idea! I’m not a huge gingersnap fan, but I’m pretty sure these would change my mind!! Great job on the video, Jenny. These cupcakes would be very popular in my house! Those look delicious I love gingersnaps! Oh my, these look like little bites of heaven! Perfect for the Christmas dessert buffet!! !